The last part of your project is the presentation of all your achievements in the form of a scientific report. This module shows how to organise the information in typical recognisable sections, one by one. The beginning includes some more formal sections like title page, foreword, abbreviations and table of contents. It is important to choose a well considered title and write a good Abstract because these two items are often the reason whether a reader chooses to read the report or not. The Introduction sets the thorough basis for the work through the argumentation why the work is relevant, based not least on the literature review that is also included here. The methods section describe how the work is done. It should in principle be written so clearly that another person should be able to repeat the work and get the same results. Then follows the results section. Here you present tables and figures with an overview of all your results or rather explanations when it is qualitative data. It is often somehow analysed data while the raw data may be presented in appendix or elsewhere. The discussion is the key section. Here you discuss and explain what the results show in a broader sense by relating your results/data to the existing knowledge from the literature. It also address the limitations of the study. Finally the Conclusion summarizes your answers to the problem formulation and the Recommendations / perspectives section explains how the conclusions may be used in future investigations or contributes to a larger scope. The list of references should contain all sources used and should be written according to a strict structure. Appendices contains materials that are too lengthy or details to be included in the main report. In the last part of this module attention is drawn to the problems of plagiarism. You should in general only write your own formulations. If you want to cite a formulation from another source it should be marked according to clear rules. Similarly references should be written correctly and it is an advantage to use bibliographic software from the beginning of the work. 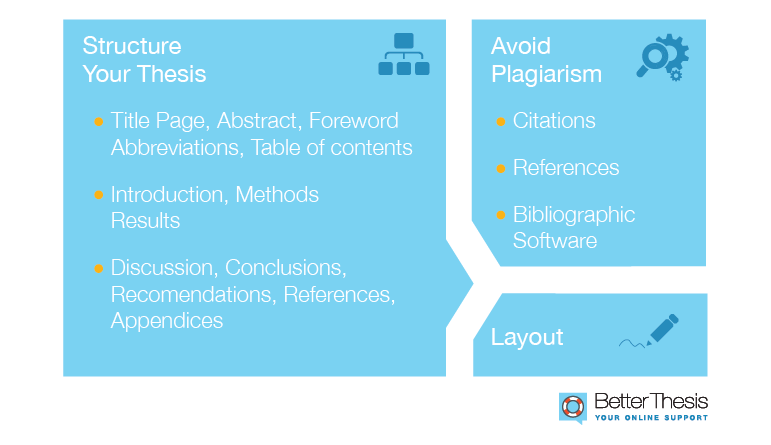 Plagiarism is taken very seriously and may ultimately lead to repulsion from the study.